My head aches. My belly feels as if it has been turned inside out and trampled by an ox. My mouth tastes like a piskie’s armpit. I try to stand up, but my legs are too weak. But no matter how I try, I cannot remember yesterday. Something is terribly wrong, and it is not just me. All around the cold fireplace, my fellow bushrangers are groaning and cursing. I suddenly realise the truth. 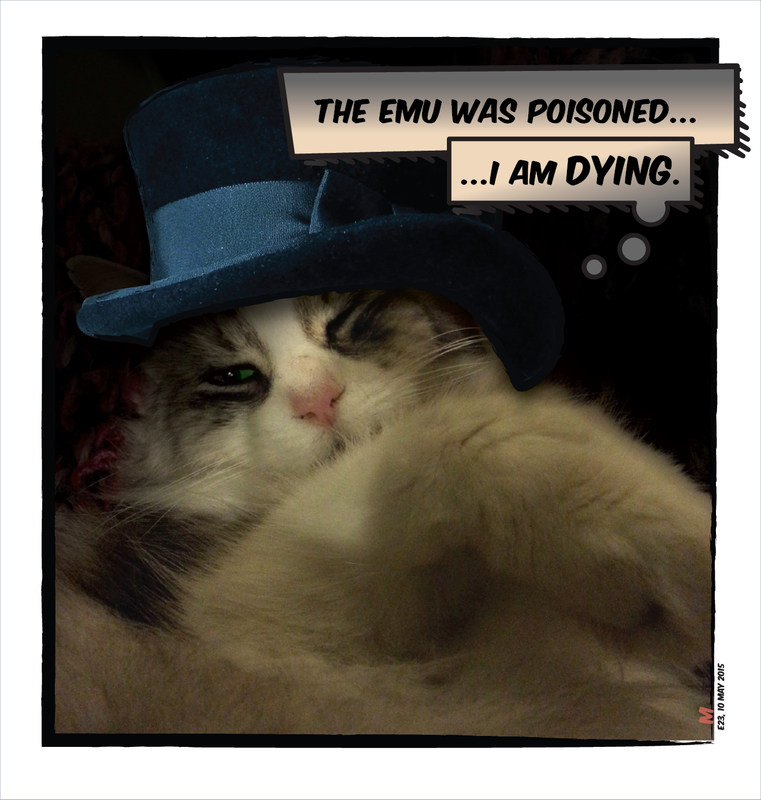 The emu was poisoned. I am dying. How did it come to this? To perish so far from home, with no one to mourn me. No one to drive the funeral carriage and the black horses. No one to fire the twenty-one gun salute. There is only one thing I can do; sing my death song. It will not be easy, but I owe it to those left behind. I open my mouth and begin very quietly, as befits a modest feline such as myself. The words and the tune are so heart-rending that I know I must share them. Modesty is important, but so is comforting my fellow bushrangers. Perhaps they will join in with their own pitiful efforts. ‘What’s that bloody awful racket?’ groans Matty, somewhere to my right. Matty is obviously deeply moved, in his rough colonial way. I smile, even though I am dying. They will not forget me in Van Diemen’s Land. Page Admin: We have just been informed that this is the final post in Volume 1 of Monsieur le-beau’s memoirs. M. le-beau is now resting, signing autographs, and posing for the covers of International Traveller, Vogue and Vanity Fair. He assures us that there WILL be a Volume 2, but cannot give us an exact date. No no no. He can’t rest. He can’t die. He hasn’t been poisoned. ‘Tis only a figment of his furry imagination. There is no such thing as a volume 2 on a life – he goes on, and his story must continue! The truth is far less glamorous. 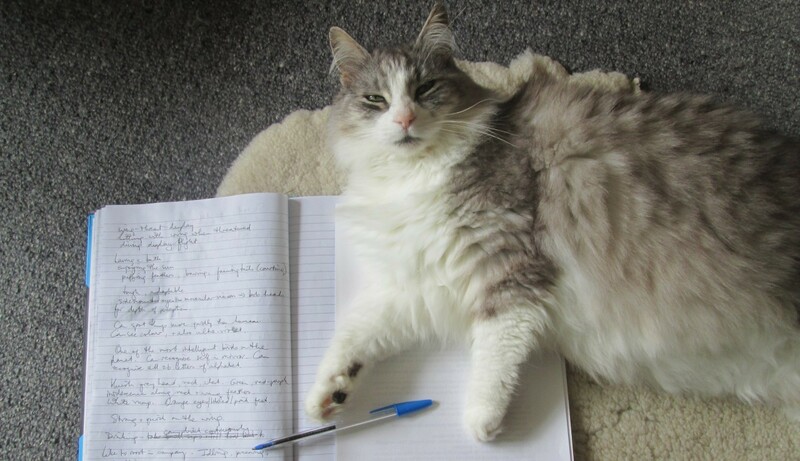 I found a well-pawed page the other day in one of my books on the craft of writing. He has clearly been researching cliff-hangers. I hoped to meet you over the weekend to find out where Harry Le Beau has been hiding. It was a good weekend, wasn’t it. I might well have seen you but not known it. And yes, Harry continues to hide, with no sign of emerging from his self-imposed writing exile.